Leading car rental companies such as Avis, Budget, Enterprise, Europcar, Hertz and Thrifty have joined VroomVroomVroom in providing quality service and great rates for our customers who want to hire a car in Darwin Airport. Darwin is very different from the other capitals. Its landscape has changed many times due to natural and man-made destruction. Also, this is an absolutely splendid car rental destination – and it's a holiday adventure you surely won't forget. Why book a hire car in Darwin with VroomVroomVroom? Rental cars are easy to book with VroomVroomVroom. With access to hire cars all across Australia, we can help you book your next car hire in Darwin Airport in no time. You can also choose to collect a rental car from Darwin, if this is more convenient. Book early for more chances of getting a great deal. Don't forget that the car rental industry works on supply and demand. If you wait too late, the rates from Darwin Airport may increase dramatically and vehicles may get sold out. We make booking a car easy. That's exactly what our system does for you. It blends into one list the available rental cars from the leading suppliers in Australia. You can also find the perfect vehicle with our wide selection of cars. We offer great rates on rental cars. We have negotiated with our partners so we can provide the best price. Read our Price Promise for more details. Trusted since 2001. We are the experts in rental cars and our friendly customer care team are ready to help you. Contact us now. Operating 24 hours a day, Darwin Airport has both an international and domestic terminal, which is situated around 15-20 minutes from the central business district (CBD). The city is comprised of wards and suburbs, which takes pleasure in a great redevelopment of its CBD. When driving around the central city, you will enjoy a more laid-back feel than the active regions of Australia, such as Melbourne and Sydney. A car hire drive from Darwin to Alice Springs is more than 1500 kilometres and takes almost 16 hours travel time at a fair safe speed. Apart from Alice Springs, there are other road trip destinations from Darwin that you can check out. Since lots of drivers are not used to driving faster, it is recommended you do the same. Take note that driving fast on gravel and dirt roads is notably hazardous particularly around corners. Regarded as the smallest of the Australian capital cities, Darwin has everything you would anticipate and hope in an Australian city: museums and parks, best cafes and restaurants, malls and hotels, marinas and beaches, and numerous outdoor festivals and markets. Make your trip more meaningful and cherished with your reliable hire car in this very special city. Upon arrival at the Darwin Airport, there are already attractions that you can check out when collecting your rental vehicle. Allow us to take care of your hire car, so you can concentrate on the most essential thing – a holiday like no other. And that's not all! VroomVroomVroom have come up with a few remarkable things that you can do and places where you can stay, shop, dine, or visit during your adventure at Darwin Airport. Check it out below! 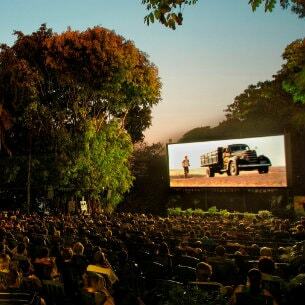 Fancy devoting a night under the stars at Darwin's premier outdoor cinema? Then visit the Deckchair Cinema. Conveniently situated on the edge of Darwin's Harbour, this award-winning independent outdoor cinema is well reachable through a bright, beautiful walkway from the City (by The Esplanade-Damoe Ra Walkway) or through the Waterfront Precinct. There are many suited parking options, as well as bike racks available throughout the location. Running successfully for more than 20 years, the Deckchair Cinema is operated and managed by the Darwin Film Society to present Darwin audiences access to flicks that would otherwise go unnoticed on the big screen. Being the only independent cinema in Darwin, feast on their program that is a diversified range of Australian - from popular to foreign to family to classic movies. Indeed, there is something for everyone to watch. A great hotspot for relaxing and full entertainment, make sure to come down early and savour a rejuvenating drink from their fully licensed kiosk (no BYO) or treat your taste buds on a hot meal. Gates at Deckchair Cinema open every night at 6.30 pm so you can have a good time on a tropical sunset before the 7.30 pm screening. If you love Japanese food, step into the Oka Teppanyaki located in Parap Road and enjoy a traditional approach of Japanese cuisine that applies an iron griddle to cook food, bringing a dynamic and memorable dining experience. 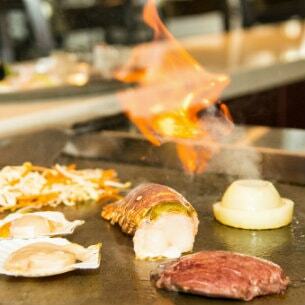 Oka Teppanyaki is a great venue for all special occasions like dinner dates, birthday parties, gathering with family and friends, or business meetings that first-timers will want to enjoy and stay for the experience. Reserve a table at Oka Teppanyaki, which uses only the freshest ingredients to produce dishes with distinctive and special flavours sure to excite your taste buds by their expert chefs - from sushi and sashimi to tempura to wafu steaks to teppanyaki to king tiger prawns to the succulent beef to the fresh lobsters to bento boxes - there's a lot to choose from. And if that's not enough, you will also witness your own meal prepared right in front of your eyes. Open for lunch from Monday to Friday and dinner from Monday to Saturday, take pleasure and also enjoy Oka Teppanyaki's wide selection of wines and hand-picked Japanese sakes to enhance your dining experience. Book and dine in now! Located on Rapid Creek, Cafe Central which is open from 7 am to 2 :30 pm, 7 days a week, has become the prominent choice for families, workers and couples, looking for perfect haven from the heat and hard work usually connected with residing in Tropical Darwin. This relaxing cafe is a great hotspot if you dig and savour international menu with outdoor tables and local art on the walls. Thirsty for more information? Cafe Central, which is run by owners Daniel Treacy and Katie Anderson, offers great coffee, which many declare the best in Darwin and with an all-day breakfast and lunch menu. 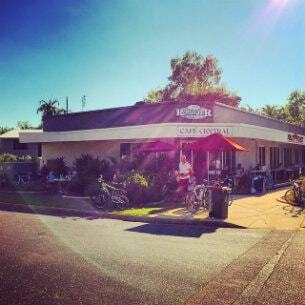 Regarded also as one of the best kid, bike and dog-friendly cafes in Darwin, Cafe Central provides baby chinos, dogs are offered with fresh water and riders can enjoy ice cold hand towels to cool them down after their long rides. Everyone who comes in at Cafe Central can assure to get an exceptional and festive attention in the form of table service and ice cold water. Situated in the heart of Darwin city, get face to face with some of the largest and hungry saltwater crocodiles at Crocosaurus Cove. Recognised as one of the must-see attractions when visiting Darwin, take this once in a lifetime opportunity to grab a friend or go solo and hold a baby croc. Are you a thrill seeker and brave enough? The 20-minute underwater experience is perfect for you. Get lowered into the water and swim with some of Australia's giant crocs into the 'Cage of Death'. Don't miss to witness and check out archer fish, barramundi, sawfish and whiprays in the aquarium, as well as the reptile house and turtle enclosure at Crocosaurus Cove. Also when in this very special city, now is the perfect opportunity to delve into the fascinating culture of the local Pudakul people on this real, nature-based experience. Acquire information on traditional medicine, learn how to propel a spear, or play the clapsticks. Furthermore, look into the importance of Dreamtime and Djukbinj, as well as the Rainbow Serpent. Pick up on the history as well as the native atmosphere of Darwin Harbour on four diverse nature-aimed tours. You may thirst to explore the local marine habitats and grounds of cultural importance, and find time to discover what truly transpired when World War II reached to Darwin. Drive around and go deep into the heart of Australia on a day tour packed with trip and discovery. Located near the township of Batchelor, have a look on the rich greenery of Litchfield and enjoy watching waterfalls, woodlands and towering termite mounds. Connect and take time out to look at the sunset over prawns and sparkling wine before you go back to where you are staying at. Enjoy the rare experience of witnessing the mountainous landscape of the scenic Kakadu National Park from the air and on the ground – all in one day. Up in the air, you will get high its hugeness, catching sight of savannah forest, the Arnhem Land Plateau, and meandering rivers. Also, enjoy a boat cruise on the Yellow Water billabong, a place to plenty of birdlife and lots of saltwater crocodiles. Experiment and try a selection of unusual and exotic flavours and grasp elegant handcrafted pieces at the Mindil Beach Sunset Market. Crowds flock on the shore of the Arafura Sea to witness the sun slip below the horizon, browse hundreds of stalls and enjoy the buskers every Sunday and Thursday night. You can also hit the spa and get a relaxing massage while you are there. Explore Darwin for a memorable adventure with your reliable car hire in Darwin Airport. Discover the finest and world-class restaurants, hotels and things to do with our best Darwin Airport Travel Guide to plan your vacation. Enjoy!